Organised for individual balloon meets only. Area from east of the Pennines to the coast and from the Scottish border to a line from the Humber to Sheffield. OS Landranger maps 80, 81, 87, 88, 92, 93, 94, 99, 100, 101, 104, 105, 106, 107, 110, 111, 112, 113. English Rose - Crispin Williams (Chairman)/Adrian Clark (Secretary); Jules Verne - David Barlow (Treasurer); Shadowfax - Stuart Bridge (Safety Officer); Swan Flight - Geoff Beckwith; Fred - David Smith; and Aeolis - Brian Boyce. The first event was a Trans-Pennine Challenge. The first balloon meet was held at Belton House on 19/20 August 1978. Full details are in the regional newsletter 'Scoop'. The annual membership fee is due on 1st January. 'Scoop' - Published 4-5 times per year. 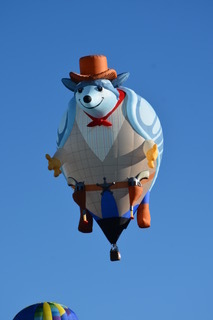 Awarded annually for 'Outstanding Achievement in Ballooning'. Awarded annually for a close encounter of the tree kind! Awarded annually for fostering good landowner relations or 'going above and beyond' to ensure a good relationship is maintained. Awarded annually to a member of either the North West Balloon and Airship Club or the Pennine Region Balloon Association for the longest, non-stop flight across the Pennines, in either direction. A trophy is awarded at each of our meets; open to all pilots attending the meet. Merchandise: Sweatshirts, Rugby shirts, Polo shirts, Car Stickers, Enamel badges.